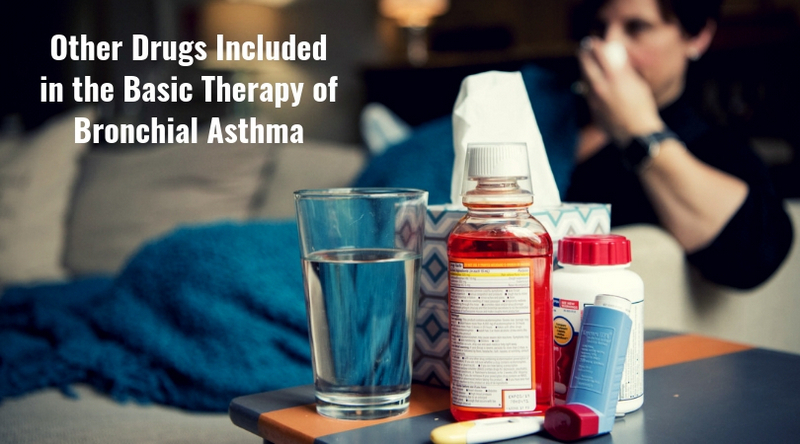 In addition to inhalation glucocorticoids, there are also other drugs that are part of the basic therapy for asthma. These are blockers of leukotriene receptors. Leukotrienes are involved in the pathogenesis of asthma. Together with histamine, they relate to mediators of an allergic reaction of immediate type. Histamine causes a fast and short-term bronchospasm, leukotrienes – stunted and longer bronchospasm. Concrete data show that leukotrienes play an important role in the pathogenesis of asthma and allergic rhinitis. They cause a spasm of smooth muscles, disrupt mucociliary clearance, increase mucus secretion, attract eosinophils into the airways and improve vascular permeability, which leads to edema formation. The numerous studies confirmed the data on the positive effect of antileukotriene drugs in persistent asthma. Bronchial asthma is often accompanied by rhinitis. In addition, isolated allergic rhinitis increases the risk of developing asthma. The ARIA report 2007 contains recommendations to use antileukotriene drugs for the treatment of isolated allergic rhinitis, as well as rhinitis, which accompanies asthma. With a mild allergic rhinitis, these drugs can be used in mono mode. cysteinyl leukotriene (CysLT1) antagonists: montelukast (Singulair), zafirlukast (Accolate) and pranlukast (Onon), which is used mainly in Japan. also, the so-called FLAP inhibitors, which inhibit 5-LO activating proteins, are still being investigated (in clinical practice). children from 2 years of age). Data on the benefits of ALTD for asthma exacerbation is extremely small. Small studies have shown an improvement in peak expiratory flow rate (but the level of evidence is only C), and therefore an assessment of the clinical significance requires additional studies. Currently, the role of antileukotriene drugs in the treatment of asthma has been proven by a large number of studies. According to international conciliation documents, leukotriene receptor antagonists are used from the first stage of therapy as monotherapy or from the 2nd stage of therapy in combination with inhalation glucocorticoids. According to international recommendations, leukotriene receptor antagonists are used from the first stage of therapy as monotherapy or from the second stage of therapy in combination with inhalation glucocorticoids. The most often appointed preparation is Montelukast (Singular). But these drugs, most often remain a second-line therapy. Preparations of the FIRST line, still are inhalation glucocorticoids, which are more preferable than leukotriene receptor blockers. You can not replace any steroids with antileukotriene drugs. “PRACTALL” (Practicing Allergology) recommends the use of montelukast (Singulair) for mild asthma, especially if it is a virus-induced one. The drug is taken orally 1 time / day, regardless of food intake. For the treatment of bronchial asthma, montelukast should be taken in the evening. In the treatment of allergic rhinitis, the drug can be taken at any time of the day. With a combined pathology (bronchial asthma and allergic rhinitis), the drug should be taken in the evening. Antileukotriene drugs have anti-inflammatory and bronchodilating effect, have a high safety profile, and the action of standard therapy to improve asthma control. These drugs have a quick effect and are easy to apply. The use of antileukotriene drugs allows you to personalize therapy (with different phenotypes of asthma. Antileukotriene drugs relieve the symptoms of asthma and are the drugs for the basic therapy of this disease, especially when combined with inhalation glucocorticoids. Montelukast is recommended for patients suffering from asthma with concomitant allergic rhinitis. Positively affects the treatment of aspirin-sensitive patients with asthma. Leukotriene receptor antagonists are included as monotherapy in children with mild persistent asthma, especially if it is virus-induced (evidence-based medicine). Antileukotriene drugs lead to a significant improvement in the control of asthma in children (including children 2-5 years). Reduce the frequency of exacerbations of asthma caused by a viral infection in children aged 2-5 years with intermittent asthma. Blockers of leukotriene receptors prevent bronchospasm caused by physical exertion or cold air. Good afternoon. How long should I take Singulair for allergic rhinitis? Is Singulair used in allergic rhinitis without coughing? Should I start taking it in advance, before flowering? How long can Singulair be used? A year, two, three? There is no information. There are no restrictions on use since this is a basic therapy. All basic therapies have one principle: you need to take medications as much as you need. I only take Singulair and have no asthma symptoms until I stop using it. While I use Singulair I completely forget about this problem. In this situation, I still need to add inhalation glucocorticoids? No, not necessary. Apparently, you have a mild stage of asthma. You can use low doses of inhalation glucocorticoids. Singulair helped me until this year. Now it does not help. What to do in this case? I know that Singulair is taken for 3 months. Can it be used once a year or should it be taken 2 times a year? The long reception for 3-6-9 months is possible. This is a basic therapy. Should I take Singulair before the expected exacerbation (flowering)? If you know (from the experience of past flowering seasons) that you can not do without Singulair, then you need to start it in conjunction with other drugs 2 weeks before flowering. If there is no such experience, there is no reason for using Singulair.